Home » » Senate Disbands Pro-Buhari Group, Suspends Omo-Agege. Senate Disbands Pro-Buhari Group, Suspends Omo-Agege. The Senate on Thursday disbanded a parliamentary support group loyal to President Muhammadu Buhari. It also handed a six-month suspension to Senator Ovie Omo-Agege (APC, Delta Central) over his comments that the amendment of the Electoral Act, 2010, re-ordering the sequence of the 2019 general elections, was targeted at President Muhammadu Buhari. The Buhari Parliamentary Support Group, which was chaired by Abdullahi Adamu, senator representing Nasarawa West, had Omo-Agege as member. The group staged a walkout on the day the bill was passed. This followed the consideration and adoption of the report of the Senate Committee on Ethics and Privileges led by Sam Anyanwu (PDP, Imo East). Anyanwu’s committee had originally recommended 181 days in its report as well as the demand that the said pro-Buhari group be disbanded with immediate effect. However, the 181 legislative days which amounted to more than a year was reduced to 90 legislative days (six months) following interventions by senators who used earlier apologies tendered by the embattled colleague on the floor of the Senate to plead on his behalf. Ahmad Lawan, the Senate Majority Leader (APC, Yobe), had led the pack in making a case for the embattled colleague on the basis of unity, compassion, and the fact that Omo-Agege had tendered an apology. “Mr. President, it’s always your wish and ours that we treat this chamber as a family, that when any member of the family errs, we should correct him. “When Sen. Omo-Agege criticised the Senate in his comment, he stood up on the floor and apologised. And one of our colleagues said that it was courageous of him to have apologised. “And I’m saying that it would also be more courageous for the Senate to accept his apology. “But for the report to recommend suspension of 181 days based on the fact that he went to court, provably out of the fear that he would be severely punished, I would suggest that he withdraw the court case, so that we don’t suspend him,” Lawan had said. Sen. Kabiru Marafa, while aligning with the position of the Senate Leader, questioned the behaviour of some senators who were claiming to love President Buhari more than others, describing the act as hypocritical. “I’ve always said that I’m not a hypocrite; I don’t wish to be one, nor die as one. Senator Omo-Agege, as I’ve seen, has the right as a Nigerian to air his view in whatever forum. “And, like the leader said, he had done something commendable by apologising. “I’m for the president and when the chips are down, I will vote according to my conscience. “We also remember that after the Senate president implemented the party decision, we agreed to dissolve all groups, including ‘Like Minds’ and ‘Unity groups’. “But for some people to come back and form another saying that they are the ones supporting the president that is something we should not allow to stand. “We should let the president know that these people are his greatest enemies. “So, let Omo-Agege go and withdraw his court case, and also let them dissolve that group of theirs, then we can drop the issue of suspension,” Marafa said. But Bala Ibn Na’Allah, the Deputy Senate Leader, begged to differ as well as disagree with the Senate president. 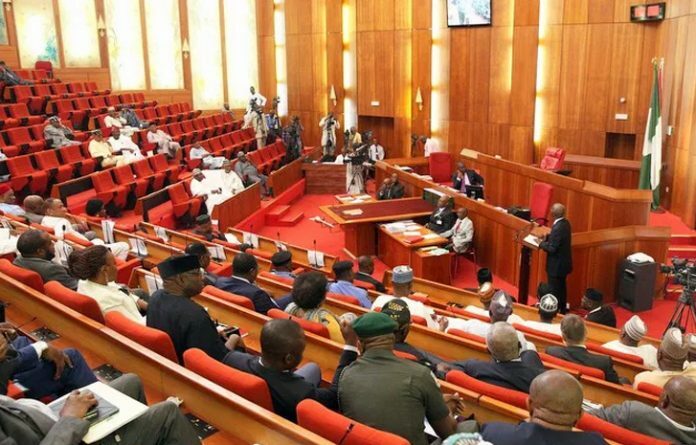 He said: “Senator Omo-Agege came to this floor and tendered an apology, but it should be known that the existence of such a group puts the lives of other senators at risk. “There are places where you cannot even go and talk about the president negatively, and there are senators from those places. “For four years of my life, I was with the president going from one place to another before he became president. “Most of the people who are claiming to know and love the president today only assumed their self-acclaimed positions after the president had emerged. “And for the purpose of the credibility and respect for this institution, we made rules to guide, and I will on the basis of that rule disagree with you, Mr. President. Before putting the matter to vote, Saraki said, “A number of points have been raised, one borders on the integrity of this institution, and to me, that is the most important thing. “And there are the things bordering on the belief that some people can say they are leaders of parliamentary support group for Mr. President. “If there’s anybody worthy of claiming such a support for the president, I should be leading in that regard, but this is a matter of institutional discipline. He, therefore, reduced the suspension to 90 legislative days. The Senate experienced a rowdy session on Thursday over comments by Senator Enyinaya Abaribe (PDP, Abia South) that President Muhammadu Buhari was incompetent. Abaribe’s comment followed a motion he moved under matters of urgent public importance. The senator was reacting to the president’s assertion in the United Kingdom on Wednesday that the killer herdsmen that have terrorised many communities across Nigeria were “Libyan mercenaries trained by Gadhafi’s soldiers”. Buhari was said to have made the comment while receiving the Archbishop of Canterbury, Sir Justin Welby, at the Abuja House on Wednesday. He reportedly blamed the farmers-herders clashes on militias trained by Muammar Gadhafi, the slain Libyan leader. Consequently, Senator Abaribe, while reacting to the comments in the Senate, stated that Buhari’s comment was an admission that Nigeria had been invaded by foreign fighters. He, therefore, wondered why the president was still the commander-in-chief when he could not protect the country from invasion. Abaribe said: “The matter of herdsmen versus farmers that two explanations were given by highly ranked security personnel in Nigeria. “First of all, the IGP said these killings were as a result of laws passed by states. “Secondly, the defence minister said these killings were as a result of the blockage of routes through which these herders are to move their cattle. “And we continued to look at all these explanations. Yesterday in London, the commander-in-chief of the armed forces of Nigeria and the president of Nigeria said the killings are as a result of the people who were trained by the late Muammar Ghaddafi, and so implying that these people doing these killings in Nigeria are from outside Nigeria. “And even if he says they are invaders from outside Nigeria, what it means is that now it validates my last point on this floor. “When a commander-in-chief cannot take care of invaders invading Nigeria, why is he still a commander-in-chief? After the presiding officer, Bukola Saraki, managed to return order to the chamber, Senate Majority Leader, Ahmad Lawan (APC, Yobe), then cited order 53 of the Senate rules, saying that “the president deserves respect”. “The president of the Federal Republic of Nigeria is the leader of this country and deserves the respect and courtesy of this chamber and those of us in it,” Lawan said. Continuing, he said: “I was once a member of the opposition and I do not recall ever calling the then president names or insult him. Providing some intervention on the matter, the Senate President, Bukola Saraki, cautioned Sen. Abaribe, saying that offensive words should not be used. Abaribe, in his defense, said, “I am very well guided by you but there are words that there are no alternatives to. The matter was, however, laid to rest with the introduction of other items on the order paper for the day.